The unfiltered water in the village is aggressive. Our house has therefore a special filter. Quality of drinking water comes from the line, you could drink the water from the tap. Above all, the water is friendly to skin and hair. Also because the pool is refilled with filtered water, which also applies to the swimming pool. The villa was equipped with everything needed for a big family stay. Everything was fully functional and convenient, and had a very nice surprise to be able to follow the champions league matches on my favorite channels. Getting the pool heating on was very good decision and highly recommended ! Ulrich is very friendly and helpful, and everything was as promised and as shown in photos , so we were very happy to stay at his Villa and definitely recommend it ! Happy to hear that you and your family had wonderfull holidays! We had an amazing 10 days at the villa in El Gouna. The villa was absolutely perfect for us as we wanted somewhere peaceful, secluded and pretty to have total relaxation after a very busy and stressful year. 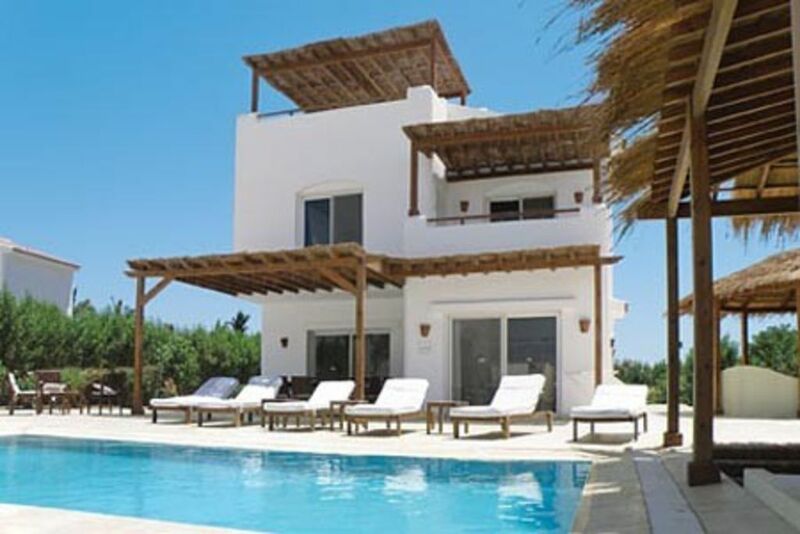 The villa is beautiful and great for families or a group of friends. We were a family of 4 for 5 days and 6 for 5 days and there was plenty of space. The beds were comfy and the bathrooms are excellent with great walk in showers. We used the guest house as well for my nephew who was on crutches so he didn't have to go up and down many steps. The villa is really well equipped so there wasn't anything we needed to bring such as towels etc. Communication with the owner and the management company beforehand was efficient, helpful and friendly which made me really confident about the stay. The management company were helpful throughout the stay if we needed anything. We arranged for a cleaner to come every day for an hour which meant that everywhere stayed clean and the only thing we needed to do was put the dishwasher on. I recommend future visitors book an hour or 2 as it is great value for tourists, provides employment for locals and means you can just be thoroughly relaxed. The pool was cleaned daily and is perfect for people who want total privacy. We brought some inflatables with us and it was wonderful chilling in the pool with a book. Talking of books there is a little library of books to read; mainly German but also some English. We tended to have breakfast at the villa, hang out by the pool and then go into town to eat in the evening. There are plenty of places to eat in and all are very reasonably priced if you are a foreign tourist. A meal for 6 with soft drinks was about £45/£50 and portion sizes are big. A supermarket shop of basics from Best Way consisting of some boxes of water, bag of ice, lots of soft drinks, eggs, butter, bread, cheese and some snacks was less than half what it would have cost at home. We visited the supermarket on the first day but after that ordered over the phone. Taking taxis to downtown El Gouna is easy and cheap (between LE25 and LE40) but there is also a bus stop right next to the Phase 5 entrance. If you are staying for a week or more and want to venture out from the villa I highly recommend a day trip to Mahmya. The beach is beautiful and is great for snorkelling. If you get lucky on the boat ride there, which my husband did, you get to see dolphins! Des vacances de reve !!! Nous avons resides dans la villa du 31 mars au 8 avril 2014 . Nous sommes des habitues de l'Egypte mais c'etait notre premiere fois en location . Nous avons ete vraiment enchantes par la totalite de notre sejour : le transfert A/R aeroport en minibus etait a l'heure aller comme retour . L'agence gerant la maison sur place est serieuse et reagit en quelques heures en cas de petits desagrements . Le proprietaire au telephone parle francais et est tres sympathique . La villa est grand et magnifique , le chauffage de la piscine a ete tres appreciable (cetait meme indispensable a cette epoque de lannee) . La maison est tres bien equipee , et on s'y sent comme chez soi : ecran plat dans le salon , tv dans chaque chambre , cuisine avec tout ce quil faut , 2 salles de bain , internet tres haut debit (Skype fonctionne tres bien) . Les lits a votre arrivee sont faits ; il y a egalement des serviettes et serviettes de plage . Le nettoyage de la piscine et l'arrosage du jardin est effectuee tous les jours par du personnel discret . il y a 2 chaines tv en francais . Si vous ne souhaitez pas cuisiner , plusieurs restaurants livrent a domicile gratuitement (restaurant thailandais, chinois , burgers ... ) . Il y a un telephone dans la villa pour appeler gratuitement le taxi ou faire sa commande au restaurant . El Gouna est une ville agreable pour toute la famille : Marina pour se promener , plage privee , restaurants , attractions (segway, jeux gonflables... ) . La population y est tres agreable ; l'endroit est tres securise (un poste de securite se situe a 50m de la villa ) . Se deplacer est tres facile : 15 LE soit 1.5€ le taxi par trajet pour se rendre nimporte ou dans El Gouna . Nous y sommes alles en couple avec notre bebe . Nous recommandons cette villa aux couples comme aux familles . En quelques mots , n'hesitez pas , ce sera des vacances inoubliables !! Wir hatten eine super entspannte Zeit! Wir haben die Woche bei nicht ganz tropischen Temperaturen dank der Poolheizung sehr genossen. Wir haben alles wie beschrieben vorgefunden und waren dank der hilfreichen Hinweise des Vermieters bestens vorbereitet. Alles hat super funktioniert vor Ort und wir hoffen, dass wir Gelegenheit finden wiederzukommen. Schöne Villa mit tollem Blick über die Lagune auf die Berge. Eine Ausstattung, vor allem auch in der Küche, die keine Wünsche offen lässt. Leider hatten wir nur 10 Tage Zeit, da hilft nur wiederzukommen. The lively town of El Gouna lagoon thrilled with an attractive mix of award-winning architecture, shops to, its own marina and a variety of sports and leisure activities. The entrepreneur S. Sawiris discovered the peninsula as an ideal berth for his yacht, and beheld the perfect spot to build his dream home for friends and family. Between azure waters and the stunning backdrop of ostägypt. Massif were built gradually and the first houses in the course of the last 20 years at this location was a city. The White Villa Eshe was completed in 2009 and stands quietly next to a wide lagoon, yet it is only minutes away by tuk tuk (motorized Rischka) into the vibrant center or to the Kitestränden. Golf: For information on the golf course. Bei Ankunft ist im Haus alles gerichtet. Das einzige, was Sie jetzt zu tun haben: ein Badetuch schnappen und in den Pool springen, denn Ihr Urlaub hat gerade begonnen. Über Bade- und Handtücher hinaus liegen auch Strandtücher für die Sonnenliegen (und für Tauchausflüge) für Sie bereit. DIE ENDREINIGUNG IST INKLUSIVE. Zwischenreinigungen optional. Strom, Wasser und WiFi und täglicher Poolservice inklusive! Unsere Agentur bietet einen zuverlässigen und günstigen Transferservice von und nach HRG Airport an.